Polycom VVX D60 handsets pair with Polycom VVX Business Media phones to enhance workplace mobility. 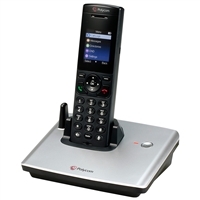 The handset communicates via DECT with the base station, which connects to the computer network via SIP. Up to five D60 handsets can be paired with a VVX phone.